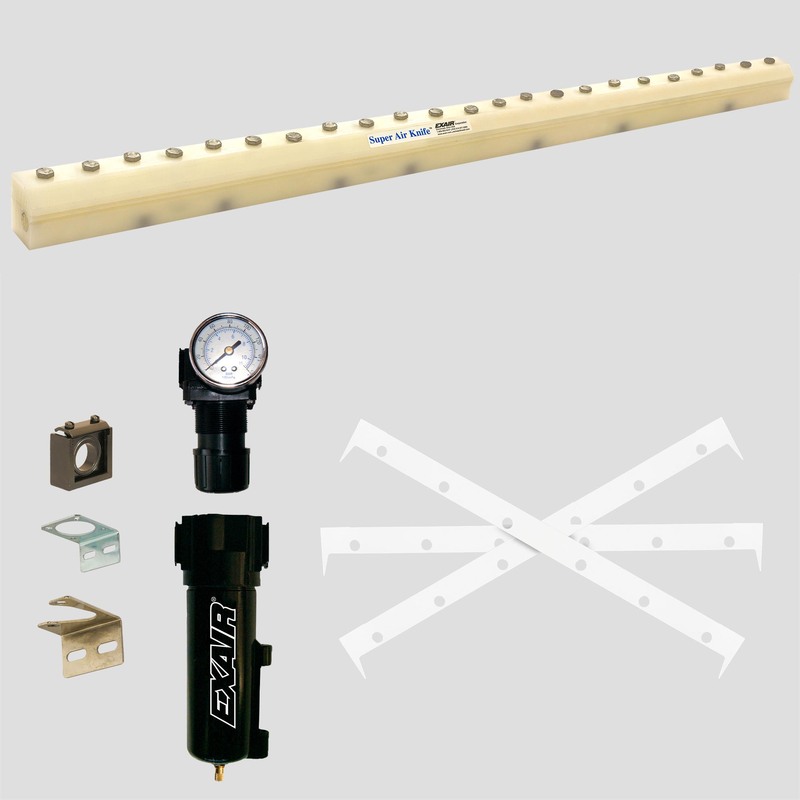 EXAIR Super Air Knife Kits include a Super Air Knife, shim set, filter separator and pressure regulator (with coupler). In industrial applications, air knives offer an efficient way to clean, dry or cool parts, webs or conveyors as well as acting as an environmental separator or air curtain. EXAIR's Super Air Knife is the most efficient compressed air knife on the market! It delivers a uniform sheet of laminar airflow across the entire length with hard-hitting force. It is engineered to dramatically reduce compressed air usage while entraining ambient air at a ratio of 40:1. Noise levels are greatly reduced when compared to other blowoffs. Available from stock 3" to 108" long and made from aluminum, Type 303 stainless steel, Type 316 stainless steel and PVDF to meet your application needs. Custom sizes and materials available. Super Air Knife cools molten plastic as it exits a dip mold. PVDF Super Air Knife Kit includes PTFE shims, filter and pressure regulator. 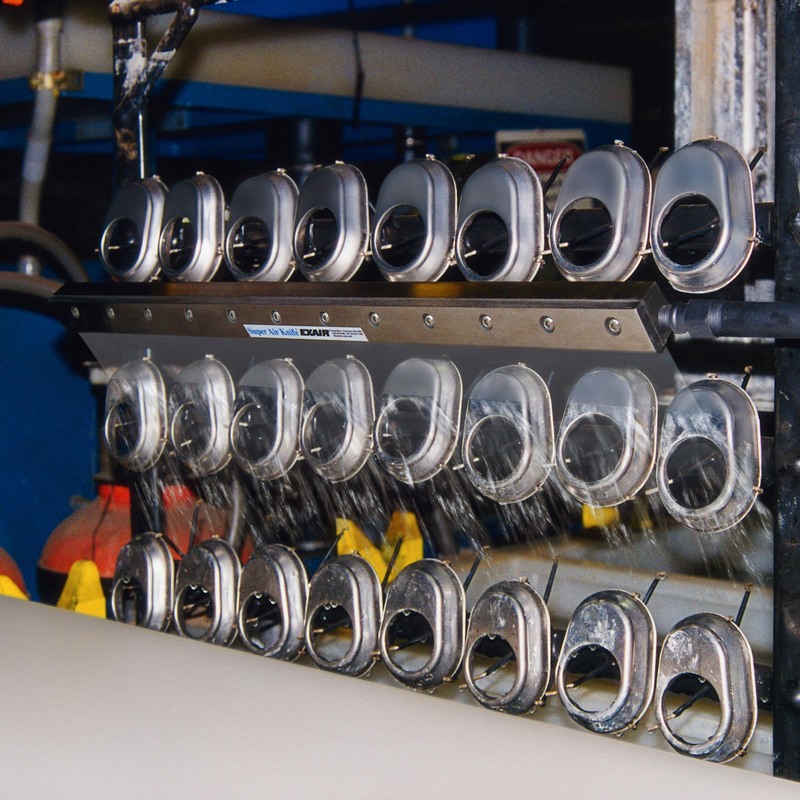 Stainless Steel Super Air Knife drys fish after passing through a rinsing process. Stainless Steel Super Air Knife blows off cans after a cleaning process. This Super Air Knife removes water from parts exiting a wash cycle. An aluminum Super Air Knife removes water from the bottom of aluminum cans. This long Super Air KNife with Plumbing Kit installed removes slag and debris created by a laser cutting operation. Every aluminum, stainless steel or PVDF Super Air Knife Kit includes the Super Air Knife, Filter, Pressure regulator and appropriate material shim set.